The crossover segment has been heating up lately, and it’s easy to understand why. A crossover combines the best elements of cars, SUVs, and minivans into a practical, multi-functional vehicle. They’re excellent for people who enjoy the feel of a car, but prefer the high seating-position and extra utility of an SUV. Plus, not only are they more fuel-efficient than larger SUVs, but several of them also offer comparable cargo capacity. In this article, we’ve listed the crossovers with the most space. Keep reading to find your favourite! 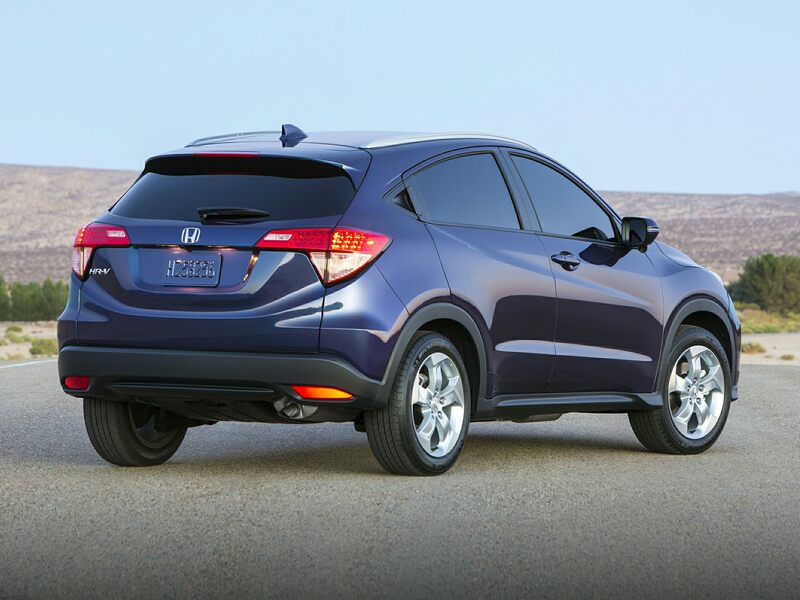 The first on our list of crossovers with the most space is the 2018 Honda HR-V. Named one of Edmund’s Best Small SUVs for 2018, the HR-V is a top contender in the crossover segment. What’s more, it also happens to be unmatched when it comes to cargo hauling. Now in its third year since first appearing on the scene, the HR-V is a big-seller in Honda’s lineup. Along with its innovative cargo solutions, it boasts class-leading fuel economy ratings, plenty of standard options, and an eye-catching design. A jack of all trades, the HR-V is practical beyond its segment. For that reason, it’s one of our favourite picks on this list. We have Honda’s innovative folding mechanism, the “Magic Seat”, to thank for the 2018 HR-V’s capacious cargo storage capabilities. There are a couple ways these seats can arrange themselves. The rear seats can fold down completely flat, allowing for easy storage of larger items. Also, they can fold upwards, so you can haul stuff behind the front seats. It’s a handy trick if you need to stow delicate objects separately from whatever you have in the trunk space. The flat bottom of the trunk space makes for worry-free transportation of flat objects, like flat-screens. And for added versatility, the front passenger seat folds down flat, so you can load long items hassle-free. Finally, lifting heavy objects into the back of the HR-V is made easy by a conveniently low lift-over height. Aside from its clever cargo options, there’s a lot more about the HR-V to be excited about. First, its engine is charismatic and fuel-efficient to boot. It’s a 141 horsepower 1.8-litre, 16-valve, 4-cylinder engine. It achieves a segment-leading 8.3 L/100km in the city, 7.1 L/100km on the highway, and 7.7 L/100km combined. The engine can be paired with a six-speed manual transmission, but the available continuously variable automatic transmission (CVT) is more efficient and is needed should you want all-wheel drive. Practical in size, versatile in cargo storage, and conservative in fuel consumption, the 2018 HR-V is one to watch this year. Second on our list of crossovers with the most space we have the 2018 Nissan Qashqai. Smaller and more affordable than the larger SUVs Nissan offers, like the Rogue and the Murano, the Qashqai is affordable, good on gas, and has class-above cargo capacity. It has plenty of advanced safety and driver assist equipment, and the intelligently designed interior can seat five adults comfortably. When it comes to cargo, the Qashqai’s best asset is its flexible Divide-N-Hide storage system. With it, you can configure the storage area precisely how you want it. It has panels that can be set in various positions in the trunk space. These allow you to stash delicate items safely without worrying about them rolling around while you drive. Plus, it’s super handy to have when you want to stash valuables out of sight. What’s more, the 60/40 rear-seats fold down completely flat, giving you a total storage space as large as any competitor. But even with the seats up, there’s still an impressive amount of space. Lastly, the Qashqai’s legroom and headspace is nothing to worry about unless you come from a family of Yao Mings. In which case, you would have a tough time fitting in any vehicle. Under the hood, power comes from a commendable 2.0-liter 4-cylinder engine that produces 141 horsepower and 147 lb-ft of torque. That’s nothing to brag about, but it’s more than enough for everyday driving. After that, drivers can look forward to their Qashqai being winter ready with an advanced all-wheel drive system. Nissan’s Intelligent All-Wheel Drive is standard to the top SL trim, and it is also optional to the lower two trims. It reacts quickly to changing road conditions, and will send power to the wheels that need it for optimal traction. In terms of fuel economy, the Qashqai can achieve 8.8 L/100km in the city, and 7.3 L/100km on the highway. That’s at its best, equipped with Nissan’s Xtronic CVT transmission system and front-wheel drive. All-wheel drive brings those numbers up to 9.0 L/100km in the city, and 7.5 L/100 on the highway. Eco Mode is standard, and it adjusts engine and transmission response to maximize fuel economy. In sum, the Qashqai is a crossover with a personality. It’s great for maneuvering around busy city streets, and can function as a road trip wagon just as easily. Next on our list of crossovers with the most space is the 2018 Mazda CX-3. Drive the CX-3 around long enough, and you’ll start to think you’re driving a sporty sedan instead of a crossover. Its sharp handling and potent but fuel-efficient engine make for an unrivaled driving experience. Cargo space is slightly underwhelming on the spec sheet when compared to the HR-V and other segment leaders. But that said, it’s still quite large, and with the rear-seats folded down, your storage options improve drastically. Performance is where the 2018 CX-3 excels. It draws power from a 2.0-litre 4-cylinder engine that produces 146 horsepower. That engine is paired to either a 6-speed manual or a 6-speed automatic transmission. As well, all-wheel drive is available to all trims. In terms of fuel economy, it can achieve 8.2 L/100km in the city, and 6.9 L/100km on the highway. The CX-3 is most at home on a curvy back road, where you can really enjoy its sharp, responsive handling. Most notably, this year’s CX-3 saw the introduction of Mazda’s award-winning G-Vectoring Control system. It makes for an effortless, smooth drive by adjusting engine torque at the right moments, giving you optimal control over the CX-3. All car manufacturers like to brag each new piece of tech they develop. The difference, this time, is that G-Vectoring technology is worth the hype. Cargo space may not be as good as its rivals, but the Mazda CX-3 is still a highly practical machine. So, if cargo hauling isn’t your priority, but cruising down curvy roads is, this might be the crossover for you. Unless you’ve been living under a rock, chances are you already know about the Kia Soul. It’s immediately recognizable by its unique, out-of-the-box design. But what you probably don’t know, is that the Soul has an intelligently-designed interior, and has tons of high-tech features. Further to that, the Soul offers plenty of practical cargo options. There’s no shortage of small-item storage, and when the 60/40 rear-seats are folded down, the packing possibilities open wide up. Another positive is that the rear-hatch opens very wide, which takes away the difficulty of loading large and oddly-shaped objects. There’s an additional cargo under tray beneath the floor of the trunk too. Another aspect that sets the Soul apart from the competition is its safety standards. The NHTSA gave it a five-star rating (out of a possible five stars). As well, the Soul now has advanced safety tech, like autonomous emergency braking and blind spot detection. All this to say that you can confidently tick safety off your checklist when evaluating the Soul. The first delivers 130 horsepower, while the second in the list delivers 161 horsepower. Already, that puts the 2018 Soul above the class average. But the turbocharged engine is the preferred choice, easily outpowering the competition with 201 horsepower and 195 lb-ft of torque. Most importantly, though, the extra power doesn’t come at the expense of fuel economy. At its best, the 2018 Soul makes 9.1 L/100km in the city, and 7.7 L/100km on the highway. That’s with the turbocharged engine and the slick-shifting 7-speed automatic transmission driving it. JDPower named the Soul one of the “Highest Ranked Compact Multi-Purpose Vehicle in Initial Quality” for a third year in a row. That doesn’t come as a surprise when you consider everything it offers. It has a unique design, a top-of-the-line entertainment equipment, and enough cargo space to handle those spontaneous trips to IKEA. Altogether, the 2018 Kia Soul is easily one of the best compact crossovers on the road today. Last on our list of crossovers with the most space is the 2018 Hyundai Kona. The Kona is Hyundai’s first jump into the rapidly expanding crossover segment. It’s new on the scene, and rings in at the reasonable starting price of $20,999 (MSRP). It’s marketed towards a younger crowd and city drivers. But the Kona’s appeal extends to any fan of agile driving, premium entertainment features, fuel-efficiency, and clever cargo solutions. There’s plenty of useable space in the Kona. With the seats up, the trunk space will have more than enough room to fit a couple hockey bags. And for additional space, the 60/40 split rear seats fold down. It’s most comparable to the Kia Soul in terms of how much space there is and how it can be used. Which is to say that it’s quite versatile. Inside, there’s as much space and advanced tech as any of its competitors. A 7-inch touchscreen audio system comes standard, while an 8.0-inch touchscreen with built-in navigation is available. With it, you can stream music, talk handsfree via Bluetooth, and back into tight parking spaces with the rearview camera. Another hit factor is that Apple CarPlay and Android Auto come standard on every model. Normally, you’d have to pay extra to get Apple CarPlay and Android Auto with rival vehicles. Apple CarPlay and Android Auto is the safe way to use your smartphone while driving. With it, you can get directions, make calls, listen to your music, and send and receive texts with ease. The Kona’s standard engine is a 2.0-litre that delivers 147 horsepower. But for a bigger kick, opt for the available 1.6-litre turbocharged engine that produces 175 horsepower. When paired to the 7-speed Dual Clutch Transmission and all-wheel drive, it’s ready to tackle all driving conditions. What’s more, with Drive Mode Select, you can choose from three different driving modes to fit your preferred driving style. The Kona will adjust throttle response and steering effort to accommodate you. At its best, the Kona manages 8.6 L/100km in the city, 7.0 L/100km on the highway, and 7.9 L/100km combined. … and that’s just the short version of the list. All in all, the 2018 Kona is simply impressive. For a closer look, read our in-depth review. A crossover is a smart choice for a vehicle, particularly if you live an active lifestyle, and if you live in a city like Edmonton, where we experience snowy winters. Each pick on this list of crossovers with the most space has its advantages, and each is bound to turn heads on the road. To find the one that’s right for you, visit us online by clicking here, or give us a call at 780-777-7777. Our automotive experts are here to help you with all your car needs.